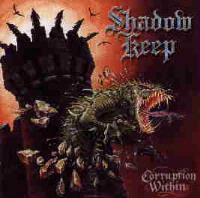 Shadow Keep are a traditional power metal band from England that I had not heard of before. Well, I think we'll be hearing more from them because "The Corruption Within" is a polished and powerful debut that should please all fans of classy heavy metal. These guys are pretty straightforward. There's not a lot of frills like choirs or sound effects and there's only minimal keyboards to flesh things out. The approach here is definitely on the medieval side, with plenty of talk of castles and battles, but it doesn't reach the absurd heights of a Rhapsody or Blind Guardian. It's pretty cliched, but they don't lay it on so thick that you gag on it. These guys remind me of the band Crimson Glory, especially their vocalist Rogue M. Mr. M has the nasal, high-pitched vocal approach of Crimson Glory's Midnight and like Midnight, it sometimes is a little much. But it fits the music well. 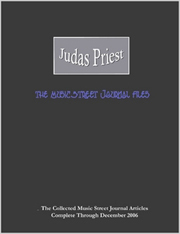 The music itself is well-produced power metal, ranging from mid-paced to speed metal (but never thrash), and featuring a lot of good melodic guitar leads from Chris Allen and Nicki Robson. I can't say the record is without problems but this is only a debut and a most promising one. Shadow Keep is a band to watch for. The band is Rogue M: Vocals, Chris Allen: Lead guitars, background vocals Nicki Robson: Rhythm and harmony guitars,background vocals James Daley: Bass guitar, background vocals and Dave Edwards: Drums Keep an eye on Shadow Keep, they are a little bit on the typical side right now but the potential is there to blossom into something special. This is a mid-paced power metal track, not a million miles away from early Queensryche and the unjustly forgotten Liege Lord (a band Shadow Keep resembles). This cut introduces Rogue M's piercing vocals right off the bat. Starting with power riffing and segueing into a very melodic verse, this is an average tune. An excellent epic, there is some pretty heavy riffing going on here. The cut also includes some good guitar soloing. No, this is not a tribute to Morbid Angel. It is a mid-paced power track with pretty cliched hooks. A good chorus helps it some. The fastest track yet, this classy speed metal mixed with some melodic and mellow riffing - good stuff! This is a fine power metal song. Strong, majestic sounding power chords,remind me of fellow Brits Marshall Law. This lengthy track really sounds like the more epic Crimson Glory. Medieval lyrics and imagery veer towards Manowar territory. Short and to the point, this is an excellent no BS cruncher that scorches. It is one of the best tracks on the LP. Complex and more shifty than the other tunes, this one goes on too long for its own good. Rogue M's vocals are on the whiny side. Another mid-paced cut, this is a little bit more melodic and again conjures up some Queensryche/Crimson Glory echoes. This "hidden"(yeah,right) track is a fine cover of the Queensryche classic.